The Red Road along the southeastern shore of Hawaii is one of those fabled American byways. Called “one of the most scenic roads in the state of Hawaii” (1), it is so far off the beaten path that relatively few tourists venture here. When I read that it “takes you through some of the most spectacular scenery reminiscent of the old Hawaii of yesteryear” (1), I knew that I had to check it out. Fortunately enough, the Red Road begins less than a mile from our vacation house in Pahoa so we didn’t have far to go. The Red Road owes its name to the red cinder pavement that originally covered it. Most of the road is asphalt now but people still use the nickname of days gone by. I found one small spot that still looked like it must have in the past. We actually started our drive at the far end of the Red Road near Uncle Robert’s and worked our way back towards Kapoho. 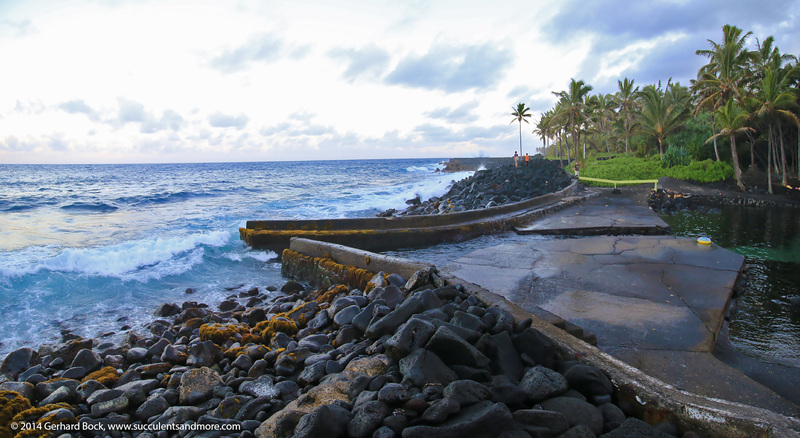 The Red Road is winding and narrow (in places no more than 8 ft. wide) and offers a variety of scenery, including lava fields, tropical rainforest, old mango groves, picturesque spots overlooking the ocean, and several beach parks where you can picnic and swim. The road is only 20 miles long, but it took us two hours to drive it because we stopped so often. Take a look at the photos below, and you’ll know why. We ended up chatting with the guy you see in the photo above, and he told us about the Kalani Retreat Center we had literally just passed. He was working there and raved about the food in the dining hall. He said anybody could buy a meal pass and suggested we have lunch there. Since we were hungry, we followed his recommendation. After buying our meal passes we drove up a long driveway to the dining lanai. The food was delicious—local, organic, and prepared with great attention to the ingredients. They even had homemade lilikoi (passionfruit) lemonade, so I was a happy camper. Back on the Red Road, the highlights kept coming. The scenery seemed to change by the minute. …and before we knew it, we were back in dense jungle where philodendrons climb to the top of towering trees and air roots dangle down so far they brushed against the roof of the car as we drove by. …and we saw houses tucked away from the road. …and a mysterious stone figure perched on a cliff. In the late afternoon, we went swimming—or rather bathing—at one of the most unique spots on the Red Road: Ahalanui Park. The pool you see in the photo below is fed from a volcanically heated spring on one end and the ocean on the other. In the second photo below you can see the inlet that separates the pool from the Pacific. The water temperature is around 90°F; it felt shockingly warm at first but I got used to it quickly. When I stepped out of the water, I actually felt cold although the air temperature was in the low 80s. We stayed at Ahalanui until shortly before closing time at 7pm. By the time we got back to our house 25 minutes later, it was pitch dark. Night certainly arrives early and falls quickly in these latitudes! Kailani or Kalani means "Heavenly Ocean." Name of our no. 7 grandchild. I love the name. What a trip. Kalani is a beautiful name, like most Hawaiian names. If I lived here, I'd try to learn at least the basics of Hawaiian. Fantastic! Great photos of a beautiful place. Bucket list! It's not for everyone--half of the road is unpaved--but it's definitely a piece of paradise. Really fantastic! I like the description "...Hawaii of yesteryear". I'd love a week or two in a secluded house like that blue one, aimlessly enjoying everything. Sigh.